Launch: Long Cove Launch Ramp, off Langford Creek of the Chester River. Small fee for launching. We left the truck and trailer at a local friend's field. Or launch at Chestertown Marina ramp, and leave your truck and trailer there. 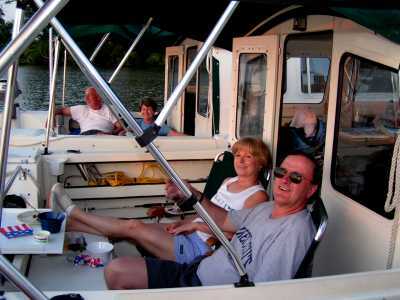 Comments: The Eastern Shore has some of the best cruising on Chesapeake Bay. --- -There are so many joys (and sometimes, headaches) that come with the cruising life. One of the best experiences (and sometimes, a headache) is coming into town. Like people, each town is unique. And coming to town from the water is certainly a different delight than coming in by road. The towns of the Eastern Shore are especially interesting, with their long colonial history and dependence on water for transportation and commerce. 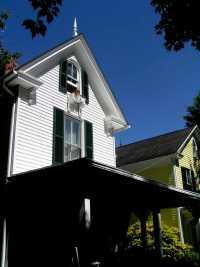 --- -This is a quiet town which traces its origin to the beginnings of the United States. 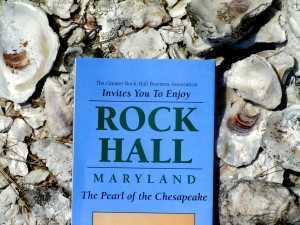 In Colonial times, the main route from Virginia to Pennsylvania and points north was by Annapolis Ferry to Rock Hall. George Washington is known to have come ashore here eight times, before journeying north to Philadelphia to help create American Independence. So too did Thomas Jefferson and James Madison. 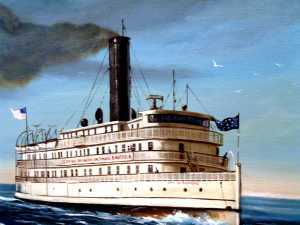 In those early years of America, the Eastern Shore was an important tobacco port-of-call. 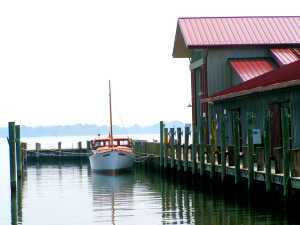 Later, it became a primary fishing and crabbing center on the Chesapeake Bay. 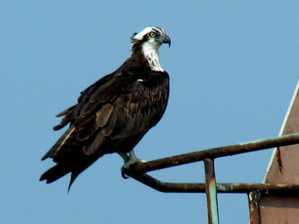 --- -Today, it is a town for those who love boating, seafood, wildlife and a peaceful way of life. There is a large fleet of charter boats, for those fishermen without their own boat. 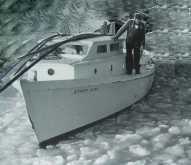 Watermen continue the long tradition of commercial fishing. 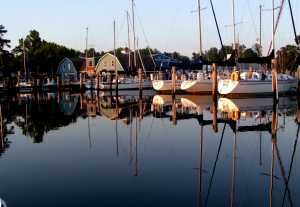 Marinas encircle the two sheltered harbors, both with easy access to the Bay. --- - There are good restaurants, with seafood as their specialty. 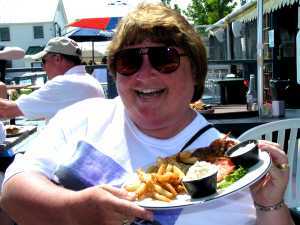 We had a marvelous soft-shelled crab at the Bay Wolf, seafood lunches at J & J Seafood and Pruitt's. 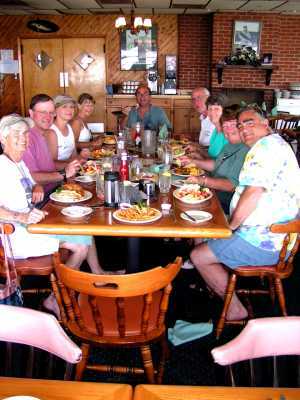 And the fish and crab dinners at the Waterman's Crabhouse are a fond memory. Ah yes, there is also the restored 19th century fountain (with great ice cream and sodas) at Durding's Store. 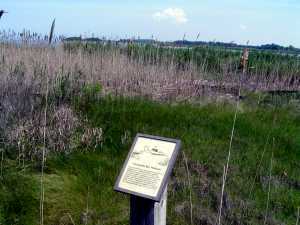 - - - The National Wildlife Refuge on Eastern Neck Island is about a seven-mile bike ride from Rock Hall. It has miles of walking trails complete with viewing platforms and interpretive displays. 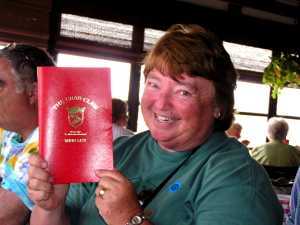 The visitor center has a marvelous collection of books for sale. The reeds and marshes of the tidal shore are feeding and nesting grounds to 243 species of migratory and resident birds and a variety of mammals, amphibians, reptiles and fish. The admixture of salt, brackish, and fresh water areas are ideal for a variety of plant species. These estuarine areas are especially important ecologically as a spawning and nursery habitat. 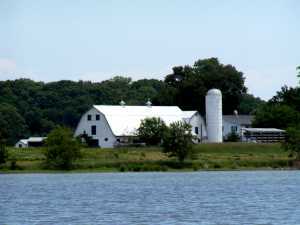 - - The farm country on this portion of the Eastern Shore is, as locals are fond of saying, "quintessentially rural." There is a grace and fluidity to both life and scenery that is almost forgotten elsewhere, with the busy pace of the 21st century. - - - - There is another special feature in Rock Hall -- the Mainstay. This is a venue for outstanding music throughout the year. We listened to an excellent internationally-known jazz/blues group one delightful evening at the Mainstay. 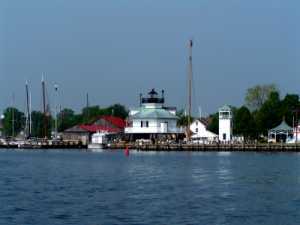 - - - - As you round the harbor marks to enter St. Michaels, you quickly realize why this town is a contender for the prettiest harbor on the Chesapeake Bay. It was founded in the mid-1600s and is one of the oldest ports on the Bay. 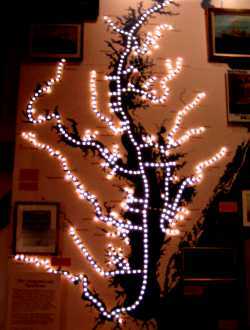 It is located about midway between the Susquehanna source and the Atlantic mouth of Chesapeake Bay. It was one of Colonial America's largest shipbuilding ports. 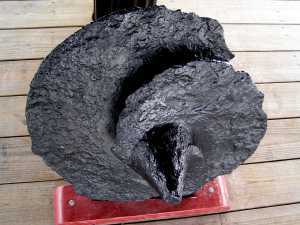 Here were made the fast sloops and shallow-draft "bugeyes" that evaded British blockades during the Revolutionary War. - - - - After the war, Baltimore developed road and water connections with the newly-freed colonies and became the major trading center of the mid-Chesapeake. St. Michaels languished. 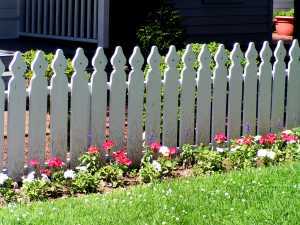 The town was rediscovered in the 1960's as a delightful place to live and visit. Its old buildings are now gentrified into art galleries, B&Bs, and interesting and fashionable tourist shops. 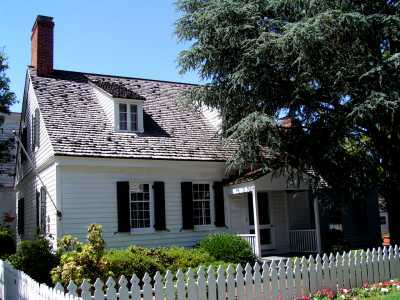 Old Georgian, Federal, and Victorian homes line the streets. 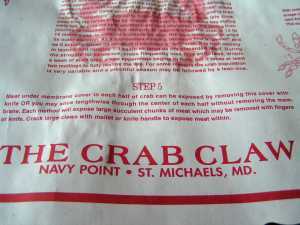 - - - - On the waterfront, adjacent to the Maritime Museum, is an institution - one of St Michaels' most enjoyed seafood restaurants, the Crab Claw. 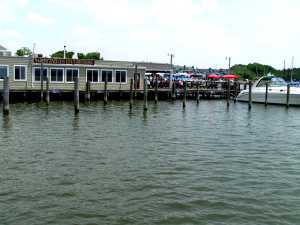 It boasts an extensive menu, and, of course, succulent Chesapeake seafood, fresh from the Bay, is the specialty. 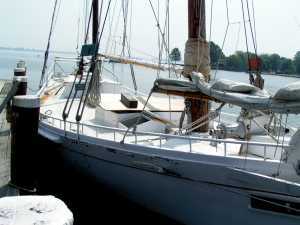 - - - - St. Michaels is both the cradle and repository of Chesapeake Bay's maritime history. 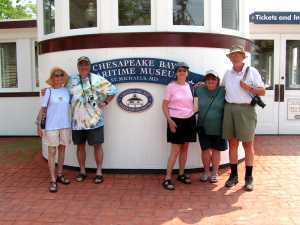 To understand that history, we visited the Chesapeake Bay Maritime Museum. - - - - Here we read the stories of the Bay and the people who have lived, worked, and played on the water. 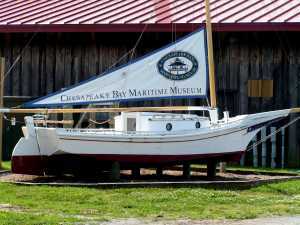 On permanent display is the nation's most complete collection of Chesapeake Bay artifacts, visual arts, and indigenous water craft. 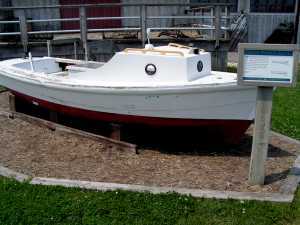 Interpretive exhibitions and public programs cover the range of Chesapeake Bay maritime history and culture - including Native-American life, seventeenth- and eighteenth-century transatlantic trade, naval history, the Bay's unique watercraft and boat building traditions, navigation, waterfowling, boating, seafood harvesting, and recreation. - - - - One of the exhibits features the Chesapeake Bay Retriever. 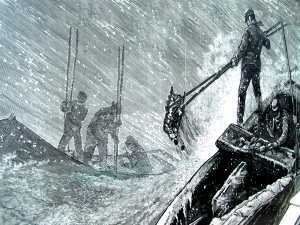 "From Shipwrecked Puppies to Iron Dogs: While sailing home from England in 1807, George Law, a member of a prominent Maryland family, rescued two Newfoundland puppies from a sinking British ship and brought them home to Chesapeake Bay. The puppies mated with local dogs and established a new breed, the Chesapeake Bay Retriever." They have double coats that keep them dry even when in freezing water, so they have no peer for waterfowling. 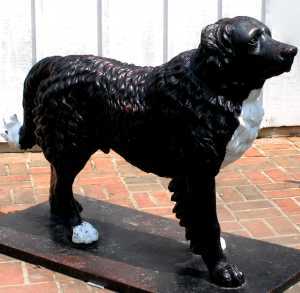 A local foundry made cast iron dogs in memory of the shipwrecked puppies and the statutes became popular lawn ornaments. 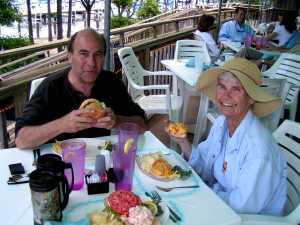 - - - - Lem and Steve Ward were two of the best-known woodcarvers in the Chesapeake region. They were famous for their beautifully carved duck decoys. 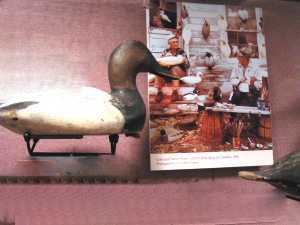 The Museum has several of their decoys on display. 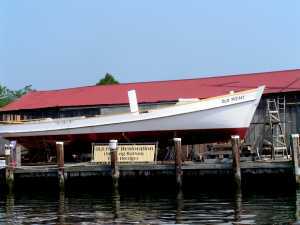 - - - - The Maritime Museum has many guides who have lived the waterway traditions. Some days, a master decoy carver sits on the porch of the Waterfowling building, carving decoys and telling stories of his life along the Chesapeake. 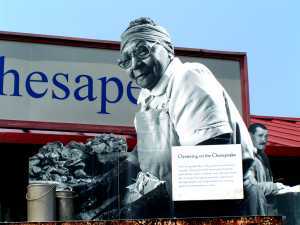 On others, a retired crab picker sits at a picnic table sharing historic photographs, talking with visitors about her memories of a picker's life. 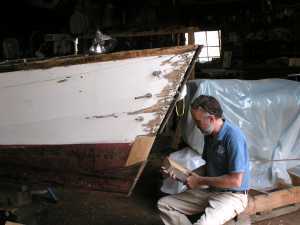 In the Museum's working boat yard, you can watch the restoration of the Bay's traditional vessels by the shipwrights, apprentices, or a visiting captain or boat builder. - - - - Some two hundred boats, representative of the craft that plied the Chesapeake, are on display in buildings or afloat at the Museum's docks. 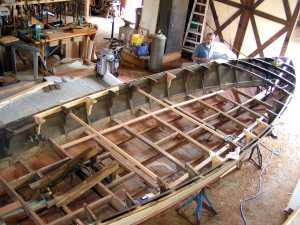 These craft range from a Native American dugout canoe to Chesapeake Bay commercial sailboats. All are carefully restored by skilled artisans and legions of volunteers, using painstaking traditional techniques. 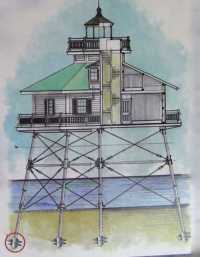 --- - A featured exhibit at the museum is the restored Hooper Strait Lighthouse. 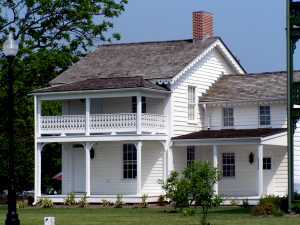 The structure was emplaced and first occupied in October 1879. The cottage-style lighthouse remained in operation until 1954 when it was replaced by an automatic lighting system. In 1966 the Lighthouse was moved to the Maritime Museum. 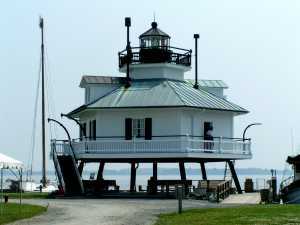 - - - Hooper Strait Lighthouse is an excellent example of the screwpile lighthouses constructed in the 19th century in Chesapeake Bay, the North Carolina Sounds, and the ocean entrances along South Carolina. These structures stand on seven ten-inch wrought iron solid pilings (legs). At the base of each piling is a wrought iron screw that allowed the wrought-iron legs to be screwed twenty-five feet down into soft mud. It would have been easier to drive the legs into the bottom, but the foundation of the lighthouse was stronger being screwed into the mud. These tightly embedded pilings protect the lighthouse not just from waves, but from the winter's ice that sometimes froze around the pilings. A rising tide can exert an incredible upward pressure on the ice-enshrouded pilings, which resisted the force by the firmly implanted screws. 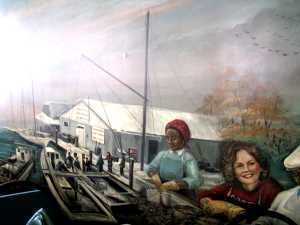 --- - There are murals and exhibits portraying the Waterman' s lifestyle and working conditions. And the story of the women who worked picking, packing and canning seafood is also told. 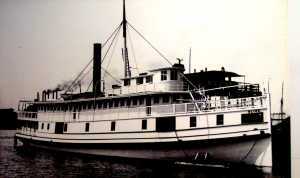 --- - Steamboats played a significant role on Chesapeake's waters in the 19th century. The museum has excellent displays to remember and interpret those bygone days. 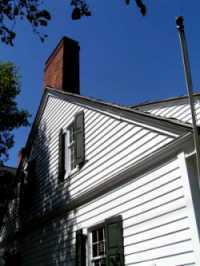 --- - Oxford, another of Maryland's oldest Colonial towns, was founded in 1694. 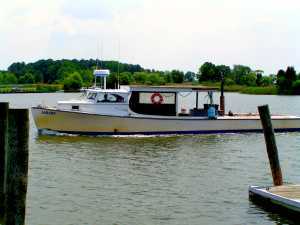 The town is located near the mouth of the Tred Avon River and has a well-protected harbor. In Colonial times it was one of only two ports of entry for British trade vessels on the Eastern Shore (the other was Chestertown) . Oxford flourished in this capacity until the Revolutionary War brought an end to British trade. 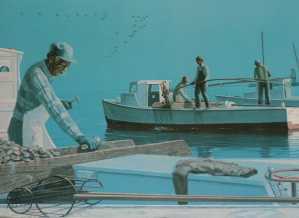 After the Revolution, like most Eastern Shore towns, the town declined for many years until oystering businesses began to flourish in the late 1800's. With the decline in oystering, it is today a quiet residential town, enjoyed by visitors who appreciate it's history and charm. 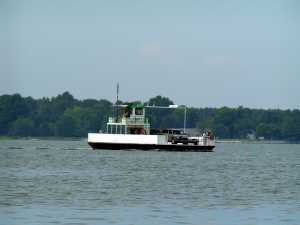 --- -The Oxford-Bellevue Ferry is believed to be the oldest privately operated ferry in the United States. --- - Cambridge is another of Maryland's oldest towns, easily accessible from the water. It is primarily a residential town in this "land of pleasant living".